You are here: Home / Bulletin Board / What do you think about cremation? A very common question. I’m asked quite frequently whether it is OK to cremate. This is a question of real moment and concern, especially to older people for whom death is (a more consciously imminent) looming reality. People are often quite torn up about this (though many have probably never even considered that it is an issue worthy of concern). What’s the issue? Well, within our culture, and within the broader Judeo-Christian tradition, burial has been the customary way of disposing of dead bodies. Cremation is sort of a new kid on the block (though in many parts of the world it has always been the norm), but has steadily increased in popularity. There are many reasons for the popularity of cremation: It is cheaper (often by many thousands of dollars). Some people are creeped out by the notion of having their remains on display at a funeral home for others to look at. Some people are terrified at the idea of having their body buried (due to a phobia of being buried alive perhaps?). For whatever the reason, cremation is often considered a preferable option to burial. Does the Bible have anything to say on this? Is there a right or wrong here? Is it just custom, tradition, personal preference? God created human beings as a body-soul duality. Adam was fashioned from the dust of the earth (body) and God breathed into him the breath of life (soul). As created and prior to the Fall, humans were one whole living body-soul, or soul-body. It was the Fall that lead to death – death spiritually (hence hell) and physically (hence physical death). Since the sin of our first parents, death has been part of our normal reality. Our bodies die and are disposed of. Our souls, subject to spiritual death, are destined for hell (apart from God’s gracious intervention). Thankfully, God has graciously intervened through the work of his Son, Jesus Christ. Christ came to undo the curse for his own: to suffer spiritual death (which he did, on the cross), and to suffer physical death (which he did, laid in a tomb). He overcame death on the third day, undoing the power of the grave (and foreshadowing the ultimate undoing of physical death) and sin. Now when a Christian dies, he leaves behind a body, but his soul persists in conscious life with the Lord. An unbeliever continues in a conscious state as well, but he is conscious of a very different reality apart from the Lord. Most Christians leave things here: heaven and hell. However, that isn’t where the Bible leaves us. This is only the intermediate state, an in-between time. God didn’t intend to leave us as disembodied souls. He made us as body-soul unities, and he intends to restore us to be such. The Bible teaches that when Christ comes again our souls will be reunited with our physical bodies (See 1 Cor. 15!). Only they won’t be our same old tired, corrupted bodies. They will be related to them in some way (as the seed relates to the plant), but they will be glorious resurrection bodies. They will be like Christ’s body: they will never grow weary, get sick, suffer pain, or die. They won’t get cancer or heart disease. We’ll live forever as God intended in our gloriously renovated spirit-bodies in a remade new heavens and new earth. So, should we cremate or bury our dead? Is it wrong to cremate? Short answer: no. There really isn’t any problem with cremation. Even though we believe our dead bodies will live again, it isn’t as if it is a problem for God to put them back together again, no matter what shape they may be in. I mean, some bodies are lost at sea, some burned in fire, some have become dust in the last two thousand years, and so on. Some of the molecules that comprised deceased saints are found in the bodies of other saints and so on. Nevertheless, it presents no challenge whatsoever for the God of the universe, the one who made the heavens and the earth, to remake you on the last day. In the Middle Ages people would be quartered as a judgment that would (symbolically at least) serve to deny them the blessing of the resurrection. But this is silly unless God is a rather pathetic and weak deity who would be puzzled by a missing femur. That’s not the God of scripture. He won’t have any trouble with the reassembly of the cremated. So, if you want to be cremated, or cremate the remains of your loved one, I don’t think there is any moral objection to doing so. We’re nowhere forbidden from cremating or commanded to bury. Nevertheless…I plan to be buried. And that isn’t just a personal preference for me. It comes from a reflection on why Jews and Christians have persisted in the burial of their dead (including the burial of Jesus). Why did this become the norm? It was because our forbearers had good theology. And they wanted even the disposal of our earthly remains to serve as a testament to our faith in Jesus Christ who overcomes the grave. 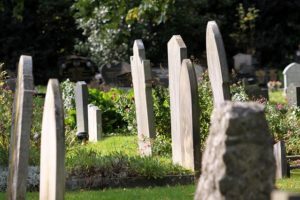 Everything about a Christian burial service is designed to highlight the sure and certain hope of Christ’s return and the general resurrection of the dead. The grave is arranged like a bed. The body is arranged as if sleeping. The headstone was traditionally shaped like the headboard of a bed. In older cemeteries tiny footboards can also be seen. This body isn’t really dead. Not in a lasting sense. It is only sleeping in the ground until the Lord comes again. Then these dry bones will live again. This is also why cemeteries traditionally face the east, pointing to the dawn of Christ’s coming with new life. So, it is OK to cremate. But it is even better to bury. Because you can make your death and burial the final occasion of the declaration of your faith in Christ who overcomes the grave, your confidence in the truth of the gospel promise to dead sinners.